The amount of trash being discarded at sea is reaching an alarming rate. In 1998, the National Oceanographic and Atmospheric Administration (NOAA) of the United States first brought the Great Pacific Garbage Patch to the world’s attention. In contrast to the public’s perception of an area of highly-visible plastic waste floating on the sea’s surface, the Great Pacific Garbage Patch is actually an area of submerged bits of plastic, accompanied by larger items. It is huge, covering an area of between 270,000 and 5,800,000 square miles. While some items lie just a few inches below the surface, others are hidden, submerged at a depth of several yards. In some places, the material actually covers the seabed. Because the items are not openly visible from the surface, the Patch cannot be detected by satellite photographs. The area only appears like a cloudy soup from above. The Great Pacific Garbage Patch comes about as a result of both human action and nature’s forces. Factories and land waste get washed into the ocean through rivers and storm drains. Debris from cargo ships, recreational liners, drilling platforms, fishing activities all add to the load. Beach-going individuals leave behind bottles and other objects, which are then swept into the sea. 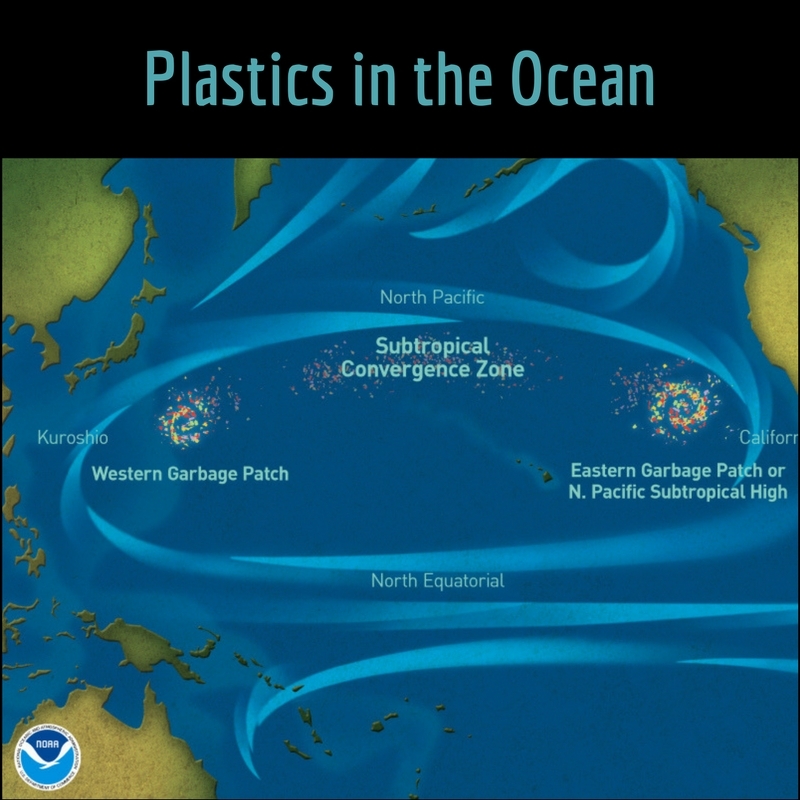 These plastic items get caught in gyres, rotational oceanic currents that run across the vast stretches of water. Four gyres are in action around the Pacific rim, circling in a clockwise direction and drawing the trash in an inward, circular motion. After months of travelling, these discarded objects eventually swirl into the middle of the area, an area of stability, and get trapped there forever. Whether these plastics are trapped in the deep ocean or shallow water, they inevitably get picked up by marine life and birds and this is when tragedy begins. 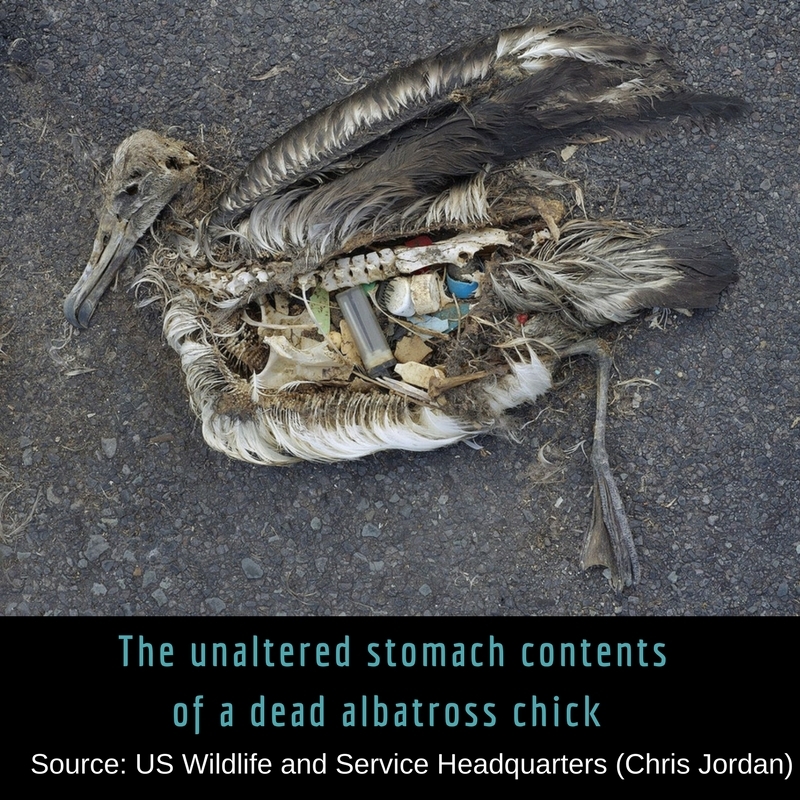 All too often, we see photographs of turtles trapped in plastic drink can holders and the skeletal remains of birds that reveal an assortment of plastic objects of various shapes, sizes and colors. These beautiful creatures of nature mistake our artificial products for food. These plastic items get trapped in their digestive systems and puncture their internal organs. Apart from these visible crimes, there is also a silent killer. Like their bigger plastic counterparts, microfiber from our garments is now found everywhere in our oceans and marine life. Each time we wash microfiber towels or apparel, thousands of strands of non-biodegradable microfiber find their way into the water systems. Once they are in our oceans, there is no effective way to remove them. Without knowing any better, fish and sea lives swallow them and so do we. To understand the magnitude of the pollution created by microfiber, we only need to step into just any apparel store. Microfiber-based products now occupy at least half of the shelf space. I was at the point of despair when I looked at the microplastic products I had accumulated in my household through the years, a period when I was ignorant of the harm they would bring. It certainly looked as if there was no way to avoid microfibers. But there is a way! Step one: We can use less and reduce wastage. Humans do not live on Planet Earth alone. We share it with the flora, fauna and many life forms that inhabit Earth, together with us. Let’s do our part and look out for one other. Reduce the use of plastic items and refrain from using microfiber. Switch to organic cotton or other environmental-friendly fabric. Together, we can make the world a better place for all. You know until I had read your posts about microfibers I was in the dark. I didnt know they were plastics! I thought it was plant based. I have always been super conscious of plastics in general, and recycle or avoid it . I hate seeing wildlife suffer over this, and yet more and more things are becoming throw away items. Aside from making the switch to natural fabrics for all your future clothing purchases, you can get a mesh laundry bag and put your synthetics in it before tossing into the washer to try to catch the escaping fibers, and they also have lint filters for washing machings. Every little bit matters.